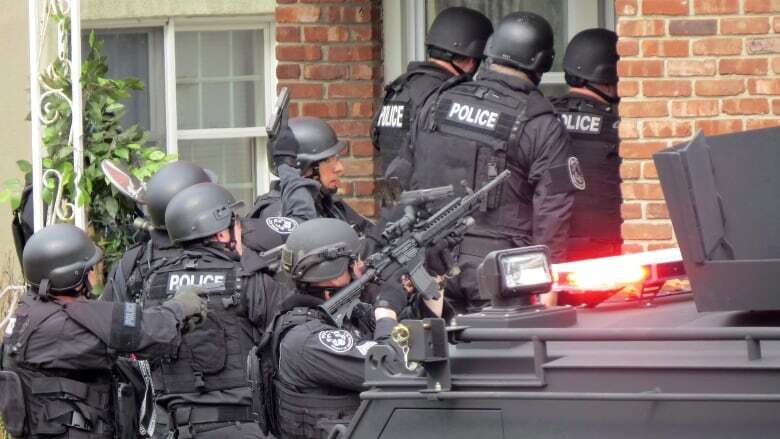 Swatting, a prank that involves phoning 911 to report a non-existent threat to someone's house, is traumatizing for homeowners and dangerous for everyone involved, including police and bystanders. More than two dozen officers, including 12 tactical SWAT members, descended on a Parma, Ohio, home Sunday night after a man called police to say he had shot his father and was holding his mother and sister hostage. Inside the home were two people completely unaware what was going on until one spotted movement outside. The supposed shooting and hostage-taking weren't real, just one of the more recent examples of the dangerous trend known as "swatting." The so-called prank — which authorities say is more accurately described as a crime — involves calling police to falsely report an ongoing serious incident like a shooting, hoping to draw the type of response seen in Parma. Incidents have been reported at the homes of single individuals or families with young children. Some use it as a way to settle personal scores with perceived online enemies or seemingly as a form of misguided fun. It is familiar in the online gaming community, where gamers call pranks on players and watch via livestream as tactical teams burst into a home with guns drawn. Fortunately no one was harmed during Sunday's incident, said Lt. Kevin Riley, from the Parma Police Department, but things could have turned out much worse. It's possible that the homeowner could have seen movement outside his home and come out to investigate with his own gun, for example. "You have the makings for a very terrible tragedy," he said. It is traumatic for the homeowners and dangerous for everyone involved, including nearby bystanders. It also ties up significant police resources both during and after the incident. "These are very, very difficult cases to follow up on, there is a lot of technology used by these perpetrators to mask their identities," he said. Perpetrators use spoofing technology to make it appear to an emergency dispatcher as if the phone call is coming from the home of the presumed swatting target. "It's relatively easy for anyone to make it appear that they're calling from somewhere where they're not," said Carmi Levy, a technology analyst based in London, Ont. "There are any number of apps, rogue apps and rogue services that allow you to spoof your location." Levy said hackers are spurred on by the fact that it's a fairly simple process that generates a high-profile response from police — and sometimes widespread media coverage. "They realize that it's a relatively easy way to raise awareness, to raise their credibility in the hacking community, which is what it's all about," he said. "It almost seems to be the hack du jour." Unfortunately, Levy said, that means police forces will have to continue dealing with swatting incidents at least for the near future. A B.C. teenager said he had conducted a North American swatting spree out of boredom at a court appearance on Monday. "I had a lot of time on my hands," he said. "I don't do anything productive, and that leaves me time to do criminal activity." He pleaded guilty earlier this spring to 23 charges, including harassment, extortion, and public mischief for swatting incidents involving more than two dozen mostly young female fans of the game League of Legends. Swatting has also been used to target celebrities, including Justin Bieber, Miley Cyrus, Ashton Kutcher and Tom Cruise. In April, a New Jersey lawmaker who is seeking to increase the penalties and fines for swatting, was the victim of one himself after someone called to say there was a shooting at his house, local media reported. York Regional Police Const. Laura Nicolle said individuals who call in swatting hoaxes typically describe very dangerous situations that involve weapons and injured people, prompting an immediate response from officers. "In the event that this was a legitimate call, we can't possibly hesitate and wait," she said. "We're not going to assume that they're false, we're going to assume that they're true." In May, York police were called to a house after an unknown caller said a man had shot his family with an assault rifle and was barricaded inside. It, too, was a hoax. Police banged on the door prompting the homeowner to open his door. He and his wife were handcuffed while their young children were escorted outside. "It's not a joke to us," Nicolle said.